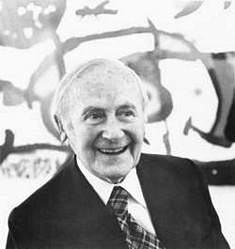 Joan Miró I Ferrà was born on April 20, 1893 in Barcelona, Spain. In 1907 he started studying at the Escuela de Bellas Artes de la Llotja. Later he would also attend the Escuela de Arte de Francesco Galí and the Circulo Artístico de Sant Lluc to further his education. His first solo show came in 1918 at the Dalmau Gallery but was not considered a success by any means. Influenced by the cubist and modernist movements at the time, he moved to Paris in 1920 to try his luck with the French. He experimented with surrealism and dadaism using techniques such as painting, drawing, sculpture, ceramics, prints and muralism. He moved to New York City in 1931 and found success as part of the Modern art movement. He was awarded several accolades such as the Grand Prize for graphic work at the Venice Biennale in 1954, the Guggenheim International Award in 1958 and the Gold Medal of Fine Arts from the Spanish government in 1980. He died in his own home in Palma de Majorca on December 25, 1983 from respiratory problems and heart disease.